Well, I am not trying to put you in a state of paranoia…but these are important questions because there are a lot of sharks roaming around who think it would be funny to unleash carnage in YOUR marriage, home, family, and life. Every day of the week, marriages get desecrated by a husband or wife stepping outside of their marriage to be with someone else. Speaking to you as a man, every day of the week, husbands find out that their wife has been with some other man. Marriage deceptions and desecrations really happen…every day of the week…and far more of them than you could ever imagine. Wouldn’t you agree that it would be far better for you to be a husband of such caliber and quality that it is virtually impossible for some other man to steal your wife? Wouldn’t you agree that it would be far better for you to be a husband who has developed your male/female relationship skills such that you know exactly how to bring out the best in your wife so that you can actually enjoy a good marriage and life with her? Wouldn’t you agree that it would be far better for you to be a husband who has proactively found the answers to the question, “How do I protect my marriage?“…than to blow it off until some shark comes along and desecrates your marriage? The fact is, if your wife is anywhere close to being a decent woman, then there ARE plenty of unethical males HOVERING around who would love to take her away from you. …until she becomes convinced in her mind that it would be a whole lot more satisfying to be with the unethical male than with you. At that point, you have lost your wife’s mind and her affections. At that point, your wife is building a fantasy in her mind that does NOT include you. At that point, you are an obstacle to your wife’s happiness and satisfaction in life. And, it is only a matter of time until her body physically follows where her mind has ALREADY went. 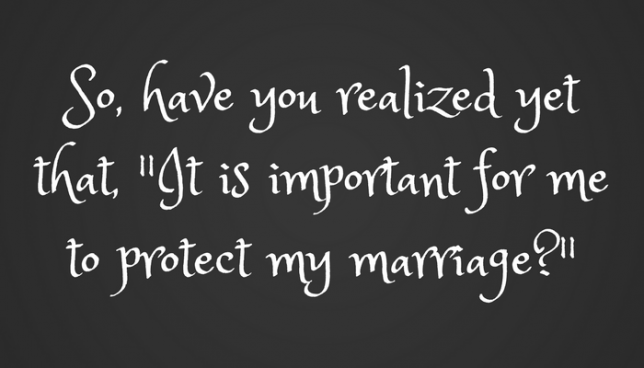 Get the answers to the question, “How do I protect my marriage?” NOW before the unthinkable happens in YOUR marriage and family.